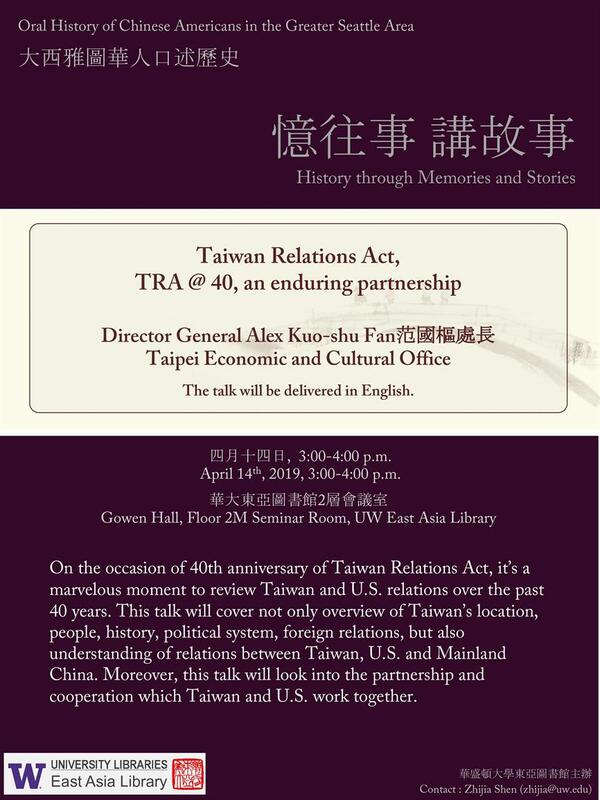 Sunday, Apr 14, 2019, 3 – 4 p.m.
On the occasion of 40th anniversary of Taiwan Relations Act, it's a marvelous moment to review Taiwan and U.S. relations over the past 40 years. This talk will cover not only overview of Taiwan's location, people, history, political system, foreign relations, but also understanding of relations between Taiwan, U.S. and Mainland China. Moreover, this talk will look into the partnership and cooperation which Taiwan and U.S. work together. The featured speaker is Director General Kuo-shu Fan 范國樞 處長 of Taipei Economic and Cultural Office. He will talk about Taiwan and U.S. relations over the past 40 years on the occasion of 40th anniversary of Taiwan Relations Act. He will give a general introduction to Taiwan and also the relationship between Taiwan, the U.S., and mainland China. And he will look into the partnership and cooperation that Taiwan and the U.S. can work together in the future.